Colon cancer is one of the top diagnosed diseases with 350,000 new cases a year, and yet with proper screenings many of these cases can be caught earlier or avoided all together. 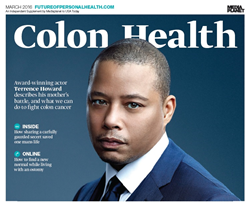 Through Mediaplanet's most recent campaign "Colon Health", which hits newsstands today, key industry leaders and celebrity advocates lend their voices to bring awareness to colon cancer, and encourage early screenings to help save lives. Mediaplanet today announces distribution of the latest edition of “Colon Health,” a cross-platform campaign raising awareness for the colorectal cancer crisis. With over 350,000 new cases of colorectal cancer diagnosed each year, the campaign educates readers in what early symptoms you should look out for on your own, what to bring to the attention of your doctor, what specific diagnostic and treatment options are available and the effects this condition can have on a patient’s support system. Being that March is Colon Cancer Awareness Month, exclusive editorial contributed by the American Cancer Society and Fight Colorectal Cancer highlight what you can do to proactively take control of your personal health. “We cannot stress enough how important it is to get tested,” says Reverend Roland Cooper, who was diagnosed with Stage 2 colon cancer at the age of 44. The campaign also features an exclusive interview with award-winning, Oscar-nominated actor Terrence Howard, who lost his mother to colon cancer. “I heard about it like everyone else heard about it: It was a name for a condition that I would never have to know” he explains, “At best that’s what I thought. I was in for a rude awakening”. The print component of “Colon Health” is distributed within USA Today on March 29, with a circulation of approximately 250,000 copies and an estimated readership of 750,000. The digital component is distributed nationally, through a vast social media strategy, and across a network of top news sites and partner outlets. To explore the digital version of the campaign, click here. This campaign was made possible with the support of the American Cancer Society, American Gastroenterological Association, American Society of Colon and Rectal Surgeons, Beckman Coulter, Fight Colorectal Cancer, Genentech, Lilly Oncology, United Ostomy Associations of America and many more.